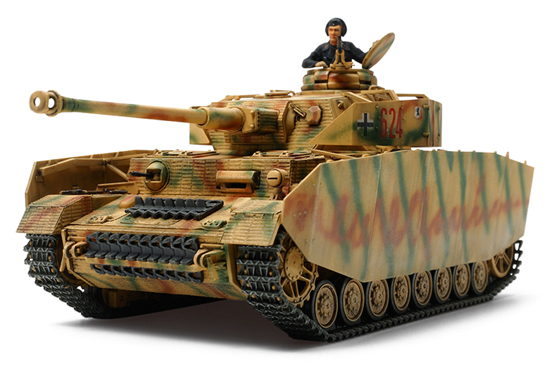 German forces relied heavily upon their workhorse the Panzer IV during WWII, and numerous variants were manufactured. 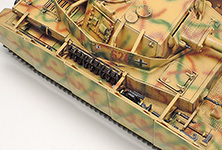 Of them, the Ausf.H is often regarded as the most polished piece of design and production. 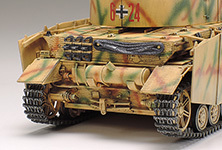 It packed a telling punch with its long-barreled 7.5cm gun, and was fitted with distinctive Schürzen armor plates to provide added protection from anti-tank rifles. Around 2,300 Ausf.H Panzer IVs rolled off of the production lines between April 1943 and February 1944, and late production variants featured steel upper return rollers and cast metal idler wheels, plus inverted V-shaped additions to track links preventing slippage. 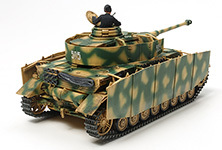 This is a 1/48 scale plastic model assembly kit of the Panzer IV Ausf.H Late Production variant. ★Length: 145mm, width: 70mm. ★The form of the tank is captured with precision, with accurate renderings of the hull-side/turret Schürzen plates and stays. 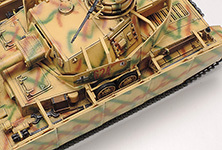 ★Separate parts provide a realistic recreation of the auxiliary muffler, towing pintle and spare track links. ★Late production variant tracks, upper return rollers and idler wheels are all depicted. ★Includes a weight for installation inside the hull to give the model an authentic weighty feel. ★Assembly-type tracks with single-piece straight sections. ★Comes with commander torso figure and 2 marking options. 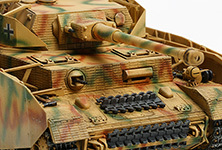 ★Marvel at the form of the Panzer IV Ausf.H fully decked out in its Schürzen armor plates. ★Separate auxiliary muffler and towing pintle parts make for a highly detailed finish. 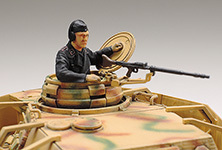 ★A torso figure depicts the Panzer IV commander surveying the scene in front of the tank. ★Take a closer look at the precision finish obtained on the Schürzen plates and their stays. ★A wide range of parts is included in the kit to depict a whole range of accessories, plus spare track links. ★Use the separately-sold Zimmerit Coating Sheet for effortless Zimmerit reproduction on your model!